Creating, nurturing and growing a business is no easy task and entrepreneurs stake pretty much everything to back their ideas, not unlike how parents do for their children. At VE, we work shoulder to shoulder with hundreds of clients at once across the globe, every day. We don’t just share their workload, but their dreams and frustrations as well, and experience their highs and their lows with them. We work every day to bring to life ideas which, while being not ours, gradually become as much ours as that of someone else. Through thick and thin. This blog is an effort to bring to the fore those moments that have elevated the work we do here into something else, something a little higher. In early 2015, Aqua Media Direct, which is based in Pasadena, California, lost three of its staffers in a car accident. Those who perished included the company’s web master and software engineer. The rest of the small staff were not technical and did not understand any of the web languages like My SQL, PHP, Apache, Ajax, Java, HTML and HTML5, nor did they have a clue about API, which was central to their dealings with various Fortune 500 companies. In such a situation, the loss of three key members could have seen the company sink without a trace, because in a saturated market, finding the right talent locally would have taken anywhere between six months to a year. In all that time, Aqua Media would have lost every single client that they had. Despite the unfortunate circumstances at hand, the harsh reality is that work never stops. At that point, Aqua Media CEO Tom Doyle and erstwhile media GM and EVP Alan Thiessen took the call of looking overseas to plug the talent gap. The resources he hired through VE not only helped him stall the backward flow of his business, but also helped him pick it up and put it back to where it originally belonged. For Alan Thiessen and Tom Doyle, looking offshore was a necessity, thanks to talent scarcity locally. Saving money (which, of course, they did) in such a situation would hardly have been a concern. A very similar story plays out in the case of Michael Elliot, who owns Fuzzy Lizard Solutions LLC. When he was diagnosed with multiple sclerosis, it effectively put the brakes on his small business. 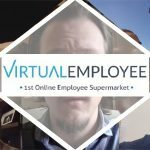 Unable to carry on, and facing heavy losses, Michael came to Virtual Employee looking for help. The resources he hired through VE not only helped him stall the backward flow of his business, but also showed great sensitivity about his situation. Within months, they helped him pick it up and put it back to where it originally belonged. Globally, Virtual Employee has worked on more than 10,000 projects for over 2000 clients, who are located in more than 30 countries. Being continents apart, we have to be prepared for any emergency that our clients might be facing. But how does one prepare for a situation where your clients are stuck in a hurricane halfway across the globe and you are basically the one running their business in their absence here? Nobody prepares you for that. Nobody can prepare you for that! Yet that is exactly what VE employees had to face on multiple occasions. In times like these, what gets you through is not your business model, nor do the innumerable certifications or awards that VE has managed to amass all these years. What matters then is the character and experience of VE’s resources, their level headedness under extreme duress, their loyalty and dedication to the job at hand. Our grateful clients like Jose Rivera, CEO of Export Service Strategies and Bryan May of Total Ops bear testimony to the fact. Of course, not all stories are so dramatic and, truth be told, it is in the mundane that we, as virtual employees, have managed to leave our most lasting impact. The flipside of working for yourself is…well you are always working! Especially in retail where you simply cannot switch off. Ask Joshua Metcalfe who owns Devlin’s Subiaco, in Subiaco, a suburb of Perth in Western Australia. While his talent and hard work was taking his business places, his social and family life had completely stalled. There were no holidays, no breaks, and no pause button. Having reached a breaking point, Joshua hired a resource from Virtual Employee, not without initial skepticism. When you have steered the boat all alone thus far, it is often difficult to hand over the controls even a little to someone who is thousands of miles away; someone whom you haven’t even met and probably might never. Yet, as time went by, Joshua not only trusted his virtual resource, he finally felt comfortable enough to finally spend a “white Christmas” with his family, travelling halfway around the world to Canada. In Joshua’s absence, his virtual employee not only kept his end up, he virtually stepped up to oversee the day to day running of Joshua’s business. Today, when Joshua talks about his virtual resource, he has no hesitation in calling him his Employee of the Year. When we get asked what we do, we present our professional resumes. And that’s that in most cases. When we have to judge success or failure, we look at cold, hard data. In a majority of the cases, virtual employees are part of a business partnership between client organizations and offshore vendors like VE, and we are forever busy looking at graphs and pie charts and statistics. Growth and profits are daily buzzwords. Yet, every once in a while, we find ourselves dealing with the human side of a business, being a part of the lives of the people behind the idea we are trying to grow. And life doesn’t happen without vulnerabilities and without imperfections. Ask us again what we do and we will tell you that we sustain too. And like so very often, sustenance is invisible, unfashionable but absolutely critical.